This is part 2 of my slide show proposing a comics festival for Houston. Part 1 is here. Read it first. 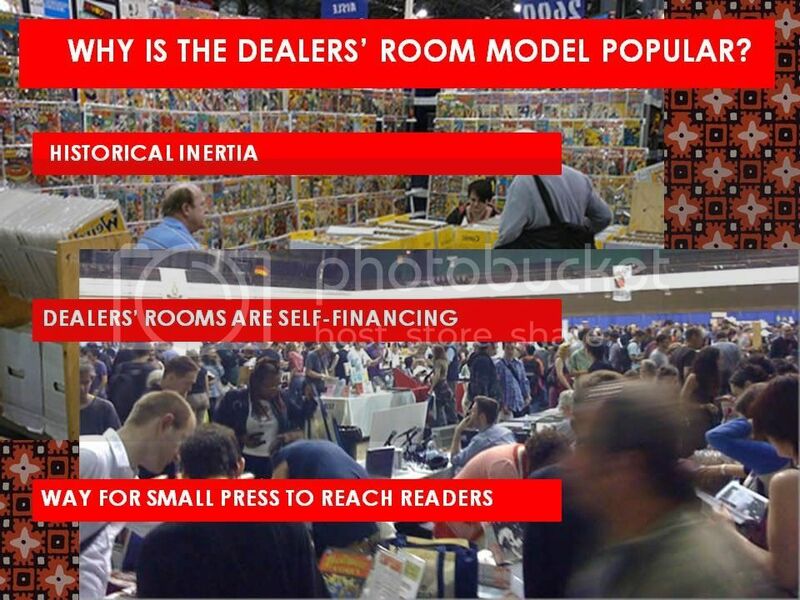 Can the dealer’s room model work for comics-as-art? Yes. In fact, it’s been a very successful model. 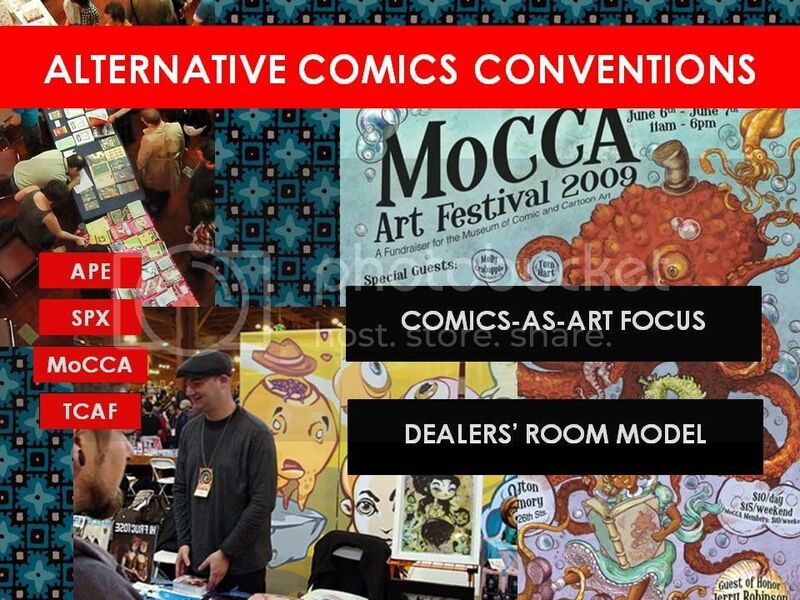 At shows like SPX, MoCCA, TCAF, etc., the “dealers” are either small publisher or comics artists themselves, selling their comics and original art. The environment at these shows tends to be friendly and intimate, giving readers lots of opportunity to interact with artists. The dealer’s room model turns out to be extremely adaptable. The dealers room model is popular for a variety of reasons. First of all, it’s been the default format for most festivals since the 1960s. It has a lot of tradition, a lot of institutional knowledge, a lot of inertia. Promoters know it can work because it's worked so many times before. Dealer's room models are also self-financing, which is a key virtue. A festival organizer can pay for everything by selling table space--in advance. And, from a comics-as-art point of view, it’s a good way to get often challenging work before the public. As anyone involved in underground or alternative publishing or music knows, mainstream distribution and retailers are often closed off to you. A comics-as-art dealers room is a way around this. In short, the dealers room model has a lot going for it. But one alternative to the dealers room model that has popped up in recent years is the academic conference. As academic attention to the artform has grown, conferences devoted to them have come into being and grown alongside the scholarship. 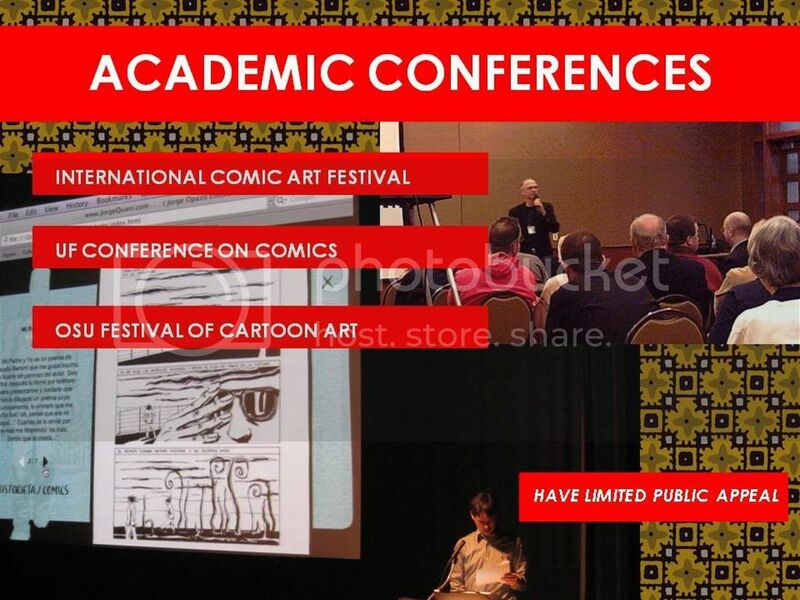 These conferences feature scholars presenting papers about comics, panel discussions, and presentations by guest artists. And, as it turns out, if you are going to explain something about comics to an audience, a slide presentation is an especially apt medium. But these conferences, by their academic nature, hold little appeal for the general public. 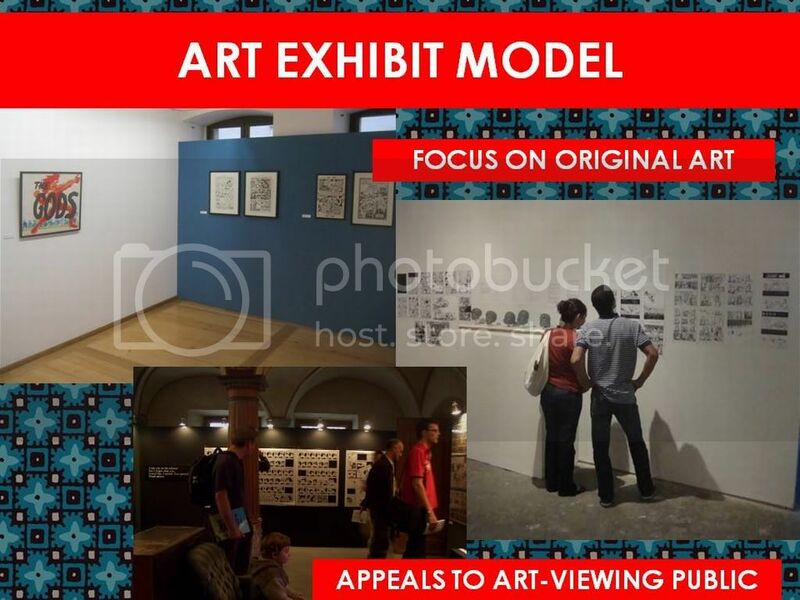 The art exhibit model focuses on cartoonists’ original art, displayed in vitrines and on the walls of museums, galleries, and other art spaces. This is not a model that has really taken hold in the U.S. But it's quite popular in Europe. This is the model I want to propose for a comics-as-art festival. 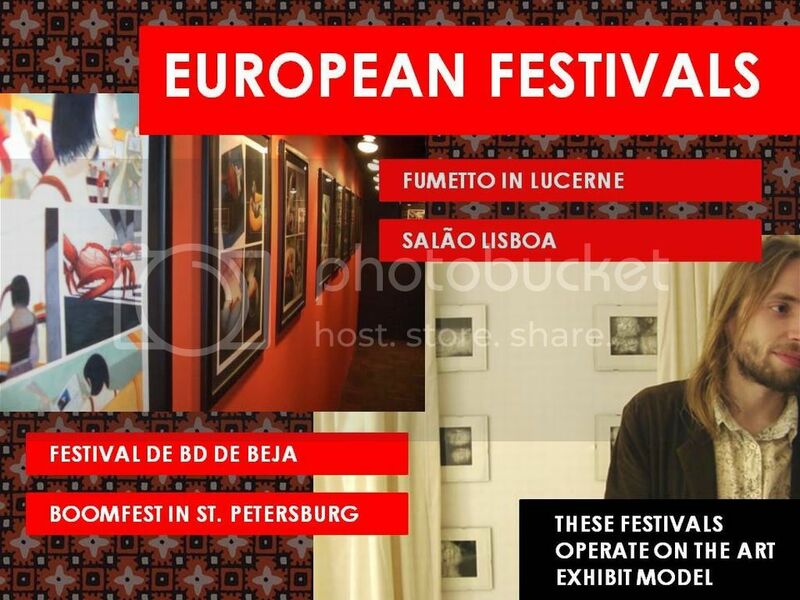 Perhaps the most famous of these kinds of exhibits is Fumetto in Lucerne, Switzerland, but there are comics art festivals in many countries—Portugal, France, Russia, etc. The biggest comics festival in Europe, in Angoulême, which combines the dealers room model with the art exhibit model--exhibits are displayed in a purpose-built comics museum. These festivals usually get a lot of state funding—either on a municipal or national level.